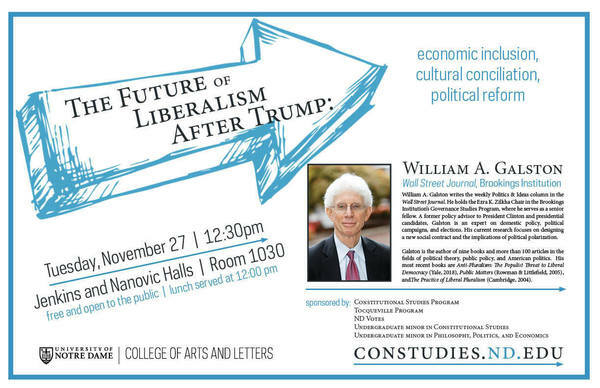 William Galston (Wall Street Journal, Brookings Institution) will be speaking at 12:30pm in Jenkins and Nanovic Halls. Lunch begins at noon – event is free and open to the public. William A. Galston writes the weekly Politics & Ideas column in the Wall Street Journal. He holds the Ezra K. Zilkha Chair in the Brookings Institution’s Governance Studies Program, where he serves as a senior fellow. A former policy advisor to President Clinton and presidential candidates, Galston is an expert on domestic policy, political campaigns, and elections. His current research focuses on designing a new social contract and the implications of political polarization. Galston is the author of nine books and more than 100 articles in the fields of political theory, public policy, and American politics. His most recent books are Anti-Pluralism: The Populist Threat to Liberal Democracy (Yale, 2018), Public Matters (Rowman & Littlefield, 2005), and The Practice of Liberal Pluralism (Cambridge, 2004).